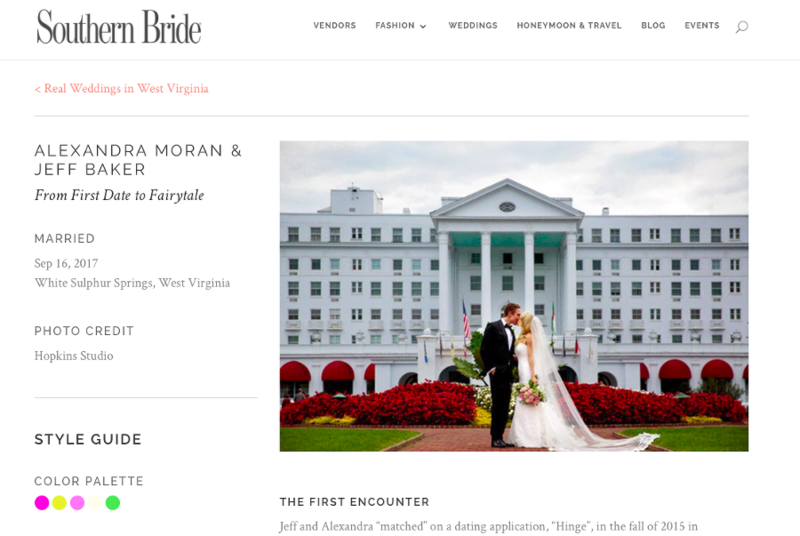 We are so excited to share than Alexandra and Jeff’s Greenbrier wedding has been featured on Southern Bride Magazine’s blog! Preparations for the wedding took place in the Princess Grace Suite at the resort with hair and makeup be completed by the amazing team from Lou Stevens Glam Squad. Alexandra wore a stunning lace gown paired with a spectacular pair of Ted Baker heels that had two hand written messages on the base of shoe, one from her husband to be and one from her mother. The gentleman prepared for the wedding in the locker room of the Golf Club after a morning of shooting at the Greenbrier’s shooting range. Our couple exchanged vows in the stunning chapel on the ground of the Greenbrier all while Wed on Canvas painted the magical ceremony. The evening continued with cocktails, dancing and spectacular food in the Cameo Room of the resort. At the end of a spectacular evening, Alexandra and Jeff enjoyed spending the rest of their evening at the hotel’s casino with their family and friends.